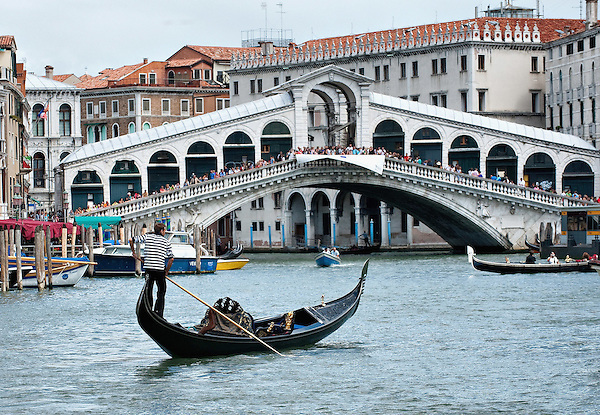 A wonderful way to take in the Grand Canal is on board a vaporetto (a rounded 230-passenger boat). I have talked before about them here and here .The canal may no longer be teeming with merchandise-laden cargo boats, but it is still the main thoroughfare of Venice, and only a little imagination is needed to understand its historical importance. The three and a half kilometre (two-mile) trip from the railway station to San Marco provides a superb introduction to the city, telling you more about the way Venice works – and has always worked – than any historical tome. Every family of note had to have a palazzo here, and this was not just for reasons of social snobbery. The palazzi are undeniably splendid but they were first and foremost solid commercial enterprises, and their designs are as practical as they are eye-catching. Vaporetto tickets can be purchased at most stops, at tabacchi (tobacconists, identified by a white T on a black or blue background) and at Hellovenezia offices On board, you can only buy single tickets. The fare for a shuttle journey (ie one stop across the Grand Canal, the hop across to the Giudecca, or from Sant’Elena to the Lido) is €2.